Though Maryland may not have as many active adult communities as some of the more popular retirement states, there are several 55+ neighborhoods in Maryland. These Maryland active adult communities have been built by a variety of developers, including Caruso Homes, Del Webb and Summit Homes. Maryland s active adult communities are often smaller than the sprawling resort-style sites found in some other states. However, retirement communities in Maryland offer amenities that support an active lifestyle. Active adults who settle in Maryland often settle in Maryland s Capital, Central or Eastern Shore regions. Active adult communities in the Capital and Central regions are primarily diverse, suburban settings that are within close proximity to major urban centers. The Maryland 55+ communities in the Eastern Shore have a more relaxed, southern feel. Though both areas offer luxurious housing and cater to affluent active adults. Despite Maryland s small size, the state has a surprising variety of climates from one region to the next. The eastern portion of the state which includes cities like Annapolis and Ocean City has a humid sub-tropical climate that brings hot, sticky summers and cold, but relatively mild winters. Moving westward, the state begins to show a cooler climate, with lower average temperatures during both the days and nights. While in the extreme western portion of Maryland, which lies in the subtropical highlands near the Appalachian Mountains, summers are mild and winters are prone to snowfall. Maryland has many prominent cities, such as Annapolis, Baltimore, Bethesda, Easton, Gaithersburg, Hagerstown, Laurel, Ocean City, Rockville and Silver Spring. The state is commonly divided into five distinct regions: the Western Region, Capital Region, Central Region, Southern Region, and the Eastern Shore. Sports lovers will be happy to know that Maryland has a number of major and minor league sports teams. There are two NFL teams in the area: the Baltimore Ravens and the Washington Redskins. The Baltimore Orioles is Maryland s Major League Baseball team. Residents of Maryland age-restricted communities, particularly those near the Washington D.C. metropolitan area, also root for teams that play out of the National Capital, such as the Washington Nationals (baseball), the Washington Capitals (hockey) and the Washington Wizards (basketball). 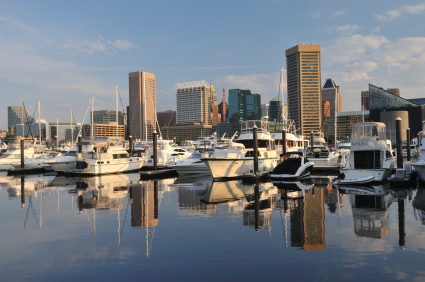 Baltimore is one of the countries oldest seaports. The Inner Harbor area was once a major manufacturing center, though it is now predominantly known as a tourist town. The harbor area includes the National Aquarium, the Maryland Science Center, several shopping centers, restaurants and museums. Historic Fells Point, which neighbors the Inner Harbor, has many restored buildings that have been converted into waterfront hotels, restaurants, shops and pubs. The Capital Region, which includes portions of the Washington D.C. metropolitan area, is one of Maryland s most populous regions. Though the area was once predominantly farmlands, it is now a thriving urban center that is home to many high-tech industries and research centers. The state touches three major bodies of water: the Chesapeake Bay, the Potomac River, and Atlantic Ocean. Active adult residents of Maryland take advantage of the states 4,000 miles of shoreline, 500 lakes, and dozens of creeks for great fishing, boating, and canoeing. Maryland s Eastern Shore is a popular tourist destination, and Ocean City is a summer hot spot. There are many major highways, which run through Maryland, connecting it with the rest of the East Coast. The state s major airport is the Baltimore Washington International Thurgood Marshall Airport (BWI), located just outside of Baltimore. There are two other major airports in nearby Northern Virginia: Ronald Reagan Washington National Airport and Dulles International Airport. The cost of living in Maryland is significantly higher than the national average. It s nearly 20 percent higher with a higher than average sales tax, estate tax, and gas tax. They enforce five income tax brackets that range from 2 to 6.25 percent of personal income. Baltimore and all 23 counties have an additional state income tax rate as well. The state sales tax is 6 percent and all properties are subject to property tax. While the cost of living is more expensive, the state of Maryland boasts one of the highest median incomes in the nation. The state of Maryland has approximately 70 hospitals, of which five are nationally ranked and twenty-five others have been recognized for strong performance. Johns Hopkins Hospital, University of Maryland Medical Center, MedStar Franklin Square Medical Center, MedStar Union Memorial Hospital, and Sheppard and Enoch Pratt Hospital are nationally ranked. Active adult communities in Maryland are ideal as it has the second best doctor to population ratio. There are about 362 active physicians for every 100,000 residents.